ing by the wayside, and for a time lived in a dugout that was on one of the tracts of land secured. To his original half-section he has added from time to time until he now has seven hundred acres of as good land as is to be found in Nebraska; sixty acres of which adjoins the town of Creighton. For twenty years Mr. Ayers resided on his homestead, and in 1896 moved to Creighton where Mrs. Ayers opened a millinery establishment in a building they bought on Main street. Here they lived some ten years and then occupied their present large residence which they bought, remodeled and enlarged in 1905. Mrs. Ayers before her marriage was Miss Almie Thornton, born at Saranac, New York, a daughter of Marshall and Susan (Lyon) Thornton. The father was killed in the battle of Gaines Mills, during the civil war. Nathaniel Lyon, the famous general of the civil war, was a cousin of Mrs. Ayers' mother, and was descended from Sir Thomas Lyon of Scotland, who was knighted in the sixteenth century. Mrs. Ayers' father was born at Royalton, Vermont, and when a young man settled in Saranac at the foot of Lyon Mountain which was named for his wife's father. Mrs. Ayers taught school for a few terms in New York and Vermont, and then in 1864 came to Wisconsin to join a married sister who had written her to come to the west, where teachers' salaries were much more generous. In September, 1865, she was married to George Ayers, who died in August of the following year, some six months before the birth of a daughter who followed her father to the great beyond. On February 1, 1870, Mrs. Ayers was married to Mr. John Ayers, a brother of her former spouse, and became the mother of two children: Nellie is the wife of Alva A. Baker, living on the original homestead, their three children are: Miles J., Nellie B., and Helen; and Niles Fred, who occupies a part of the family estate on the old homestead, is growing one of the finest Lombardy poplars in the west, which Mrs. Ayers brought as a seedling from Wisconsin. Fred graduated from the Creighton high school and afterward attended Boyles' Business College, and was employed for a number of years by a lumber firm in Creighton. So well pleased were his employers that they offered him an interest in a new yard further west. During the first three years of Mr. Ayers' ranching in Nebraska, Mrs. Ayers remained at Necedah, Wisconsin, where she conducted a millinery establishment; she owned several pieces of property there that could not be sold to advantage at the time Mr. Ayers left for the west. These she sold in 1879, packed their furniture in a car, filled the balance of it with lumber and shipped the cargo to Running Water, South Dakota, then the nearest railroad point to their Knox county home. The railroad was finished to Running Water by the time the car reached Scotland, South Dakota, so they had it re-shipped to the new town, it being part of the first freight train to come down the new line; and it had been thirty days on the way. Mrs. Ayers invested part of her ready money in a quarter section of land at one dollar and a half per acre; it is now worth over forty times that price. During the early days times were hard for the settlers. Grasshoppers devoured their crops several years, and they had nothing to market for even a scanty income. One year when Mr. Ayers raised a small crop of corn he could get but ten cents a bushel for it. The next year he had to pay a dollar a bushel for a scant amount to feed his working team, hauling it from Yankton, South Dakota, fifty miles. Twisted hay was their only fuel at times and often they burned corn when the price of that commodity was so low that three loads of it could not pay for one load of coal, and the supply of the latter many miles away. Mr. Ayers has been for many years a member of the Masonic fraternity, having been raised to his master's degree in Wisconsin, 1865; he demitted to the Creighton lodge in 1883, and with Mrs. Ayers became a member of the Order of the Eastern Star when a chapter was instituted here. Mrs. Ayers is now serving as treasurer for the tenth year, besides having filled the matron's and associate's chair from time to time. She is also a member of the Woman's Relief Corps, and is now beginning her second year as president. Fortune has smiled on this worthy couple since they came to the west, and they deserve all that has come their way. The hardships they endured merits them a generous reward. Martin H. Huff, a popular resident of Fullerton, Nebraska, and one of its most substantial business men is engaged in the real estate business at that point, and enjoys the esteem and confidence of all with whom he has to do. about five years, then sold the tract and purchased a quarter section in Cedar Valley, near Fullerton. This he made his home for two years, at that time returning to Iowa and spent one year, coming back to Nance county in 1885. He bought a half section in the same locality as his first farm, and after working it for four years again pulled up stakes and removed to Oregon, where he settled on a one hundred and seventy acre tract and followed farming and stock raising for three years, then again came into Nebraska and established himself in the mercantile business at Central City, continuing it up to 1892, at that time moving his stock of goods to Belgrade and carried on the same business for one year. He went back to his farm and remained there until 1908, when he retired from active farming and settled in Fullerton, where he now resides with his family. Mr. Huff is a man of wide experience and has been prosperous and successful in his different business ventures, at the present time being classed among the large landowners of Nance county. Politically he is a republican, in the fall of 1907 having been elected county assessor, which office he is filling at the present time to the satisfaction of his county. He has also served for a number of years on the school board. Mr. Huff was married in October, 1876, in Iowa, to Miss Mina Rice, and they are the parents of six children, namely: James H.; Belle, now the wife of H. F. Pardey; Frank H., William P., John J., and Robert F., two sons are married, and the others live at home. Henry Tienken enjoys the distinction of being the first white settler in what is now Boyd county, Nebraska, having located on the Niobrara river, eight miles southwest of Naper in 1877. He came to Niobrara in 1874, and his brother Charles, came to Nebraska in 1877, where they located on some of the land they now own. At that time, Wisner was the nearest railroad point in Nebraska, the road being built on to Neligh in 1880, and later to Long Pine, which was the western terminus for several years. The brothers engaged in raising cattle and horses until 1903, when they moved to town, Charles settling in Bonesteel, and later removing to Gregory and Tripp counties, South Dakota, where he engaged in the mercantile business. Henry came to Naper and opened a lumber yard, carrying besides a well selected stock of implements, farm machinery, and both light and heavy vehicles. He has built up a most excellent business by his fair dealing, and having always been of a genial, cheerful disposition, he could not fail of success. Mr. Tienken was born near the city of Bremerhaven, in Hanover province, Germany, April 28, 1851. His parents, Jurgen and Margaret (Berje) Tienken, spent their entire life on their farm in their native land. Charles and Henry Tienken came to America in 1870, sailing from Bremerhaven in the steamer "America." They landed after a voyage of two weeks, in New York, from which place Henry came direct to Door county, Wisconsin, working on farms in this county until coming to Knox county, Nebraska. Mr. Tienken was married in Boyd county, December 13, 1887, to Miss Alice Zimmerman, a native of Iowa and daughter of Jacob Zimmerman. Three children have been born to Mr. and Mrs. Tienken, namely: Charles L., who has a position in the Anoka Bank; William B., and Gertrude. Mr. Tienken holds no political affiliation, voting for the candidate of either party whom he feels will best serve the public good. He was reared in the Lutheran faith, and is a member of the Odd Fellows, the Workmen, and the Modern Woodmen lodges. No one appreciates more the advancement of the country than Mr. Tienken. When he first settled here, the nearest neighbors were twelve miles away; provisions were procured in Niobrara; and the nearest mills were at Norfolk and Bon Homme, South Dakota, a distance of a hundred miles or more, the time required to complete the round trip being six or seven days. Blizzards have had their share in making life uncomfortable to the western settlers, and Mr. Tienken has suffered losses, as others did. The winter of 1880 and 1881, known as "the winter of the deep snow," was unusually disastrous to him, as they lost over half of their cattle, a severe blow to beginners in the cattle business. The most notable blizzard, that of January 12, 1888, while severe, did not work havoc with their stock as did the storms of earlier seasons. They did not loose a hoof, as the storm did not last long and their cattle had fine shelter in the timber along the Niobrara river. In one of the severe hail storms that swept the western country, Mr. Tienken was caught out in the open. To save his life, he crawled under his pony, making it stand still through the icy bombardment. Of the many prairie fires he witnessed, one was started by trappers on Oak creek, March 31, 1880. All their buildings, hay and grass were consumed, leaving only smouldering ruins, they having barely escaped with their lives and saving only the cattle. During the spring of 1878 he encountered a band of Spotted Tail's Sioux Indians, who were following a band of rustlers who had stolen a herd of their ponies. He did not know for a time that they would not be hostile to him, but convinced them that he was innocent of the depredation. fore Mr. Tienken's arrival, and Middleton having come afterwards. Mr. Tienken after years of hardship and deprivation, years of toil and unremitting effort, has attained a competency, and is possessed of a large tract of land, placing him in the independent class of citizens who can look the whole world in the face and know that so long as he lives he need not owe any man. Henry Guiles was a highly respected citizen of St. Edward, Nebraska. He was for many years prominent in the agricultural regions of Boone county, having improved a large tract of land, and operated the same successfully, being at the time of his death, classed among the wealthy retired residents of that region. Mr. Guiles was born in Columbus, New York, on June 20, 1834, and was the youngest of thirteen children born to William and Phila Guiles, but two brothers of whom are now living, one in Platte county, Nebraska, and the other at Farley, Iowa. When Henry Guiles was about six years of age, he moved with his parents to Erie county, Pennsylvania, remaining there until he was twenty-two years old, then settled in Illinois on a farm. In 1858 he went to Iowa, and started farming, returning to Illinois in the fall of the year and was married to Miss Mary Dufoe, on Thanksgiving Day, their first home being in Delaware county, Iowa, where they farmed up to 1873. From there they came to Nebraska, locating in Platte county and homesteaded one hundred and sixty acres, also filed on a timber claim of the same size. Later he purchased one hundred and eighty acres adjoining these tracts, and made a fine farm of the entire lot. Mr. Guiles made his first settlement in Boone county in 1875, coming here from Platte county on account of the better educational advantages for his children, and the same year organized his school district, number forty-two, in Platte county, which was six miles wide and fourteen miles long, moving his family on the homestead, where they lived until 1893, and in the latter year Mrs. Guiles died there, survived by her husband and five children. She was a woman of beautiful christian character, greatly beloved by all who knew her, and her death was a severe blow to her sorrowing family. Her three daughters and two sons are all married and settled in comfortable homes in different parts of Nebraska, Iowa and South Dakota. After the death of his wife, Mr. Guiles settled in St. Edwards, building a good home, and carried on a prosperous real estate business, which he established fifteen years ago. He was one of the first settlers in the county, passing through all the experiences and hardships of pioneer life, and coming out victorious from the struggle, in the possession of a good property and the highest esteem of his fellowmen. When he first settled in this locality, himself and wife were instrumental in organizing not only the first school district but also the first Methodist Episcopal church in their community. Their first services were held in sod buildings, occupying three as churches until they had each in turn rotted down, and they then erected a frame building, which served as a house of worship for many years. Our subject and his family were active christian workers, Mr. Guiles having been a pillar in his church for over fifty years. On March 6, 1894, Mr. Guiles was united in marriage to Mrs. Lucretia Reeder, who was born and raised in Iowa, the ceremony taking place at Columbus, Nebraska. Mr. Guiles was a prominent Grand Army of the Republic man, having enlisted in Company K, Twenty-first Iowa Volunteer Regiment of Infantry, and took active part in the following famous engagements: Battles of Hartsville, Missouri, Port Gibson, Jackson, Mississippi, Raymond, Champion Hill, Black River Bridge, Siege of Vicksburg, Spanish Fort, Fort Blakely, and Mobile, also minor skirmishes. W. H. Root is an agriculturalist of prominence and a well known and popular citizen of Wayne county, Nebraska, residing on section six, township twenty-seven, range two, east, where he has a very comfortable home. Mr. Root was born in Cattaraugus county, New York, October 22, 1860, and is a son of Marvin and Jane (O'Connell) Root. The father was born in 1840, and was a native of Schoharie county, New York, but prior to the civil war moved to Cattaraugus county, where he lived until 1880. He served in the civil war as a member of Company G, One Hundred and Fifty-fourth New York Volunteer Infantry, enlisting in 1862, and receiving his discharge in 1865. At the close of the war, he returned to New York and resumed his occupation of farming. His wife was born in Ireland, and at the age of nine years was brought by her mother to America, the father having died previously. The voyage was made in a sailboat which was six weeks on the way. They were parents of seven children, of whom two sons and two daughters are now living. The education of W. H. Root was acquired in a log school house in his native state, and he accompanied his parents to Nebraska in 1880. The father secured a homestead and timber claim and W. H., a timber claim where he now lives. The patent for this claim is signed by ex-President Benjamin F. Harrison. They immediately set out to make improvements, and have become successful as farmers and stock-raisers. The father died in 1890 and the mother in 1904. W. H. Root is an enterprising and progressive farmer and much interested in the question of modern scientific farming. He owns four hundred acres of land in Wayne and Cedar counties, Nebraska, which all joins, and one hundred and sixty acres in South Dakota. He is ready to support the cause of education and is a substantial and influential citizen. December 26, 1882, he was united in marriage with Miss Lydia Marsh, daughter of Allen and Mary (Derry) Marsh, natives of New York state. Four children have been born of this union, namely: Marvin, born October 9, 1883, who married Bell Martin and resides on one of his father's farms in Cedar county; Guy, born September 19, 1886, who married Florence Cross, and resides on part of the homestead; Alice and Iva, twins, at home. The twins were born September 8, 1894, and both graduated from the Sholes high school in May, 1911. In compiling a list of the pioneers of Nance county, Nebraska, who have aided materially in making of that region a thriving agricultural district, the gentleman above named deserves prominent mention. For over thirty years Mr. Crabtree has been identified with the history and development of Nance county, and his labors to this end are well known by all who reside in that community. 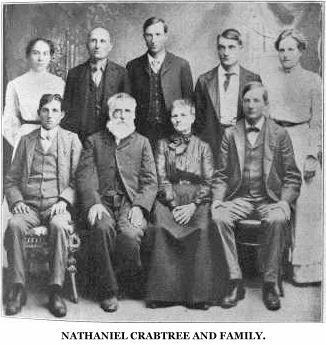 Mr. Crabtree is a native of England, born in London in 1842, and was the eldest of three children in the family of Aaron and Mary Crabtree. When our subject was two years old the parents came to America, locating in Pennsylvania, where two daughters were born. They remained in that state for about four years, then removed to Illinois, settling on a farm in Mercer county, and there the father died in 1850, his widow surviving him for four years. Both daughters are deceased, leaving our subject the only living member of the family. When Mr. Crabtree was a lad of fourteen he was thrown upon his own resources, and he began as a farm hand in Knox county, Illinois, remaining in that vicinity up to 1862, then enlisted in Company F, One Hundred and Twelfth Illinois Infantry. He was in numerous engagements, and on the eighteenth day of November, 1863, was in the thick of the Siege of Knoxville, there receiving a gunshot wound which required the amputation of his left leg on the same date. He was under General Burnside's command at that time, and saw every side of a soldier's life, suffering hardship and privation of all sorts. After his leg had been amputated and Mr. Crabtree had sufficiently recovered he was given a furlough and sent home in March, 1864. After thirty days he started for Dayton, Ohio, but on account of a severe attack of illness was taken from the train at Chicago, and sent to the Marine hospital at that place. This was at that time a government institution. Here Mr. Crabtree remained until he was honorably discharged in August, 1864, when he returned to Knox county., Illinois. He spent about two years there and in Bloomington, and in the fall of 1867 moved to Fulton, Illinois, there attending the soldier's college for about three years. After his college course he went to Mercer county and remained for two years, then came to Nebraska, taking up a homestead in Platte county. This was his home for six or seven years and all of that time was devoted to farming and stock raising, of which he made a success. He next came into Nance county, arriving here in April, 1881, purchased a quarter section of land on the Loup river bottom situated five miles southwest of Genoa, and lived on the place for several years, then moved to Fullerton, which at that time was a small village. From 1903 to November, 1910, he was engaged in the flour, feed and coal business. In November, 1910, Mr. Crabtree disposed of his business in Fullerton and is now living retired. In February, 1878, Mr. Crabtree married Marie Minsterman, at Columbus, Nebraska. Mrs. Crabtree is a native of Germany, coming to America about 1876. To our subject and wife been born seven children, namely: Aaron, Ceaser, John, Kate, Annie, Noah and William now grown and making their way honorably in life, all single except Ceaser. The Crabtree family are all well known and highly esteemed throughout their section of the country, and actively interested in the advancement of their respective localities. A family group picture of the family appears on another page. It has now, in 1911, been forty-one years since Mr. Crabtree came to Nebraska. When he settled in Platte county his nearest neighbor was seven miles away. The town of Humphrey is now on a part of Mr. Crabtree's first claim. When he settled in Nance county there was no one living between his place and Genoa, a distance of five miles. All of that country is thickly populated now. At the time he settled in Nance county the nearest postoffice was at Columbus, over twenty-five miles away. There were no fences in the county then. born in 1872. When he was only two years old his parents Anna and Hamilton Spence, took their little family to Stanton county, Nebraska, making the journey from West Point on a stage. Having arrived in Stanton county, the father bought some land, which has later been much improved, and is now the home of the subscriber. Mr. Spence himself received his education almost entirely in the schools of Nebraska, and can tell many interesting stories of a settler's life as he remembers it when he was a child. At this time, Wisner was the nearest postoffice and market place, and their neighbors were and far between. What with grasshoppers, prairie fires and blizzards, the life of the early settler was certainly made a burden. However, they remained, trusting to their efforts to produce a change. Charles Spence later started to farming for himself, and has succeeded in developing a fine farm and is engaged in diversified farming and stock raising. He has a good supply of water from deep bored wells, and his place is well equipped for stock raising. He has all buildings necessary for a well improved farm, and, moreover, a comfortable residence with many of the modern improvements. In 1901, Mr. Spence was united in marriage to Miss Alice Murphy. Three children have come to bless their home, and they are named as follows: Ada, Lynn and Orval. A history of the northeastern part of the state of Nebraska would be incomplete without doing a sketch of the life of Henry Menebroker, who is one of the most prominent of the old settlers. Mr. Menebroker is one of those sturdy sons of the German Empire who, with his parents, came to the golden west in the days of the early pioneer to seek their fortunes and build for themselves foundations for a more free and substantial life than could be had in any other country. Mr. Menebroker is a native of Germany, being born in Lotte village, Westphalen province, September 29, 1870, and was the eldest of six children in the family of Henry and Welhimena [sic] (Roower) Menebroker, both natives of the old fatherland. His father served his native country in three wars, the first in 1864, in the strife between Denmark and Germany; the second, in 1866, between Austria and Germany; and the third, in 1870, between France and Germany. Our subject's wife, who before her marriage to Mr. Menebroker, was Miss Carrie Reutzel, was born April 7, 1879, in Fillmore county, Nebraska, her parents being old settlers of this state. In 1887 Mr. Menebroker came to America with his parents where they could get cheap land and a place to make a fortune; they left Bremen, Germany, on the steamship "Wesser" sailing to Baltimore, August 14, and after landing here, proceeded westward where they settled in Clearwater, Nebraska. One sister preceded the family to America by four years and one brother, who arrived one year later. In 1904, Mr. Menebroker bought his present farm from O. A. Briton, which farm was originally the "McGowen Homestead." Mr. Menebroker now owns a fine farm of one hundred and sixty acres of land, and has four acres of good forest trees and orchard. Mr. Menebroker was united in matrimony May 7, 1902, to Miss Carrie Reutzel, and Mr. and Mrs. Menebroker have one child, Paul, who is a fine lad, born February 14, 1903. Mr. and Mrs. Menebroker are highly esteemed in their neighborhood, and enjoy the respect of a wide circle of friends and acquaintances. While not one of the earliest settlers of Pierce county, William Dedlow, of Plainview, came but a few years after his father and brothers made the first settlement on Dry Creek, about a mile from where Plainview was established. Mr. Dedlow was born in the village of Ihlenfeldt, near the city of Brandenburg, province of Meehlenberg-Strelitz, May 8, 1852. His parents emigrated to America the latter part of December, 1866, a son, Frederick Dedlow, with a sister, having preceded the family two years. Embarking at Hamburg in an old sail ship, after a voyage of nine weeks and four days, the parents and remaining children landed at New York and proceeded at once to Wisconsin, where they settled in Jefferson county and made that their home for a few years, coming to Nebraska in 1871. William, not being old enough to file on a homestead, remained in Wisconsin until 1879, where work was more plentiful and competent workmen were in demand. For four years of the six that he spent in Wisconsin, after the family migrated, he was employed in a cheese factory in Whitewater, becoming proficient in the craft. In March, 1879, he followed the old folks, and in 1880 filed on a homestead two miles east of Plainview, and a year later, with his young wife, began farming on the tract. He prospered from the start, and by his energy and industry, added to his landed possessions from time to time until his retirement from active life in January, 1910, when he was the owner of more than five hundred and twenty acres of Pierce county's finest land, all of which has been highly improved and kept in the highest state of cultivation. Mr. Dedlow is a son of Frederick and Fredericka (Grehn) Dedlow, who followed their son, Frederick, to America in 1866, and in 1871 settled on Dry Creek, near the present site of Plainview, being the earliest comers to this part of the county. The marriage of Mr. Dedlow was solemnized at Whitewater, Wisconsin, to Miss Kate Brown, a native of Wisconsin and daughter of William and Nancy (Freyer) Brown. Three children have been born to them: Frank, Inez, and Cora, married Herman Buchholz, and lives six miles south of Plainview; Inez is the wife of Carl Kettlesen, of Lyman, South Dakota; their first born is a girl, Iona Catherine. Mr. Dedlow is a republican, and from 1886 to 1892 served his constituents as county commissioner. He was attending a meeting of the board at the time of the notable blizzard of January 12, 1888, and, of course, was unable to reach home. His son, Frank, a small lad at the time, was compelled to remain at the school house during the night, a cause for great worry to the mother. A severe hailstorm in 1880 is well remembered by Mr. Dedlow, and he relates that pieces of ice as large as his fist fell at times and in some places broke through the roofs, and that for a long time after, dents where they had fallen were to be seen in bare places on the ground. When Mr. Dedlow first came to the state, deer and antelope were to be seen, but necessary work kept him too busy to spend any time hunting them. Prairie fires were frequent dangers, but no disaster befell the Dedlows from them. After years of strenuous labor, the success that has attended Mr. Dedlow's thrift and industry is such that he can, while still in the prime of life, retire from active farming and take his ease in the large, commodious home he built in Plainview during 1909 - one of the most elegant residences in the east part of town. John J. Eggers, a public-spirited citizen and prominent old timer of Howard county, Nebraska, is owner of a fine estate in Kelso precinct. Mr. Eggers was born in Holstein, Germany, September 7, 1856, and was the third member in a family of six children, being his father's namesake. His boyhood was spent in his native country, and in the spring of 1880 he started out to seek his fortune, coming to America in company with a sister, who, after a short residence in this country, was taken ill and died. Mr. Eggers' first location was at Avoca, Iowa, where he engaged in farming, remaining there for three years, then started alone with a single team and wagon to drive overland into Nebraska. His destination was Howard county, and immediately after arriving in section nineteen, township twelve, range eleven, he purchased one hundred and sixty acres of railroad land on which he put up a rough shanty and started to build up a home. Here he spent four years, succeeding in getting the farm in good shape, and in August, 1892, sold his interests and bought another quarter section a short distance from that place, this being partly improved land. He erected good buildings on the place, stocking it up well, and soon was enjoying a nice income and the well merited reputation of being one of the solid and progressive farmers of his section. Our subject was united in marriage on February 24, 1888, to Lena Hendricks, also a native of Germany, who came to America in the fall previous to her marriage. She was the second child in a family of eight, her parents now living in Grand Island with three of their children, while another daughter resides at Cairo, Nebraska. Mr. Eggers has one brother living in Hall county. Both Mr. and Mrs. Eggers are widely and favorably known for their good qualities and hospitality, and they enjoy a pleasant home. In the spring of 1908 they left their farm and settled in Boelus, where they own a comfortable residence and are surrounded by many friends. Van J. Thomas, who resides in section three, township eighteen, range thirteen, Valley county, Nebraska, is a son of Noah and Eliza (Seward) Thomas, and was born in Lee county Illinois, January 21, 1846; he was fifth in family of thirteen children, eight of whom are living. The father, who was of Welsh descent, is now deceased, having passed away in the year 1874, at Dixon, Illinois; the mother was a native of New York, she having died in April of 1846 in Illinois. Mr. Thomas received his elementary education in the schools of his home state, where he grew to manhood. On December 30, 1863, he enlisted in Company F, First Illinois Light Artillery, known as Cheeney's battery, serving until the close of the war; he received his honorable discharge July 6, 1865. Decisive engagements participated in were at Snake Creek Gap, Resaca, Kingston, Kenesaw Mountain, New Hope Church. Siege of Atlanta, and many minor engagements and skirmishes. Much of his service was performed under the command of Thomas, who was a cousin of his father. After the war he returned to Illinois and attended Dixon college one year; then entered as a student at the Ames business college in Syracuse, New York. In March of 1869, Mr. Thomas left Illinois for Nebraska, coming alone across the prairie, partly by train and walking the rest of the distance landing in Nebraska City, April 5, his financial, resources having dwindled to ten cents. However, he soon secured work on farms and in other lines and got a start again. In the latter part of April, 1869, he homesteaded forty acres of land in Otoe county, living there until 1874.
parents, Samuel and Maria (Marshman) Rodaway, sailing from Bristol to Quebec in the "Ocean Queen," settling in Columbiana county, Wisconsin. Miss Rodaway was a pioneer teacher in Nebraska schools, having taught several years in Otoe county. Mr. and Mrs. Thomas have had eight children, namely: Rozella, wife of W. E. Barrows, has six children, and lives in Montana; Isabel A., is the wife of C. E. Creager, they having three children, and reside in Colorado; Claud, who is married and has three children, lives in Greeley county; Maude E., resides at home; Florence M., is the wife of A. M. Holman and has three children, the family residing in Garfield county, Nebraska; Bessie M., residing at home; and two children were deceased in infancy. In 1874 Mr. Thomas purchased eighty acres of Baltimore and Missouri railroad land in Otoe county, which was the home place until 1883. Mr. Thomas was the postmaster at North ranch, Otoe county, for ten years, under Grant's administration. In 1883 Mr. Thomas moved to Valley county, Nebraska, where he pre-empted one hundred and sixty acres in section twenty-three, and purchased sixty acres of railroad land in section twenty-two, township eighteen, range thirteen, making a fine stock and grain farm which is still his home place. During his years in Nebraska Mr. Thomas has served in the various offices of his school boards for ten years. Mr. Thomas is one of the earliest settlers of Nebraska, and has passed through all the trying experiences and hardships incidental to frontier life. He is a successful man of affairs, and is widely and favorably known. Mr. and Mrs. Thomas have been active church workers for twenty-seven years. They were charter members of North Loup Presbyterian church, of which church Mr. Thomas was elder. Mrs. Thomas' parents are deceased, the mother having passed away in the year 1896, and the father in 1873, both in Nebraska; they were of English birth. Mrs. Thomas has two brothers and two sisters residing in Otoe county, Nebraska, and one sister in the state of Kansas. Mr. Thomas lived for a time before his marriage in a dugout and during those days saw deer grazing on his winter wheat. When the family settled in Nebraska in 1867 Omaha was the capital, and where Lincoln is now there was nothing but open prairie. he raised nothing in the dry year, 1894; July 26 of that year has been known since as the hot day. Hail destroyed his crops in 1875, and two years grasshoppers consumed his growing crops. While living in. Otoe county a prairie fire came through, burning their barn and some of their livestock; here, too, they experienced the worst blizzard in their lives during March, 1870. George R. Wycoff, the popular ex-mayor of Madison, Nebraska, is well known throughout Madison county as a successful man. He is a man of sterling character and has an extensive acquaintance, universally esteemed and respected in his community. Mr. Wycoff was born in Switzerland county, Indiana, December 24, 1862, and was second of four children in the family of John M. and Mary Jane (Abbott) Wycoff, who had three sons and one daughter. The parents were both natives of Indiana, in which state the father died in 1867. The mother some years later was married to M. J. Knox, and they have two children, a son and daughter, and reside in Lebanon, Indiana. Mr. Wycoff, the subject of this sketch, grew up to his young manhood days in Indiana, receiving his early advantages in his native state, and going out for himself in his fifteenth year. He worked in a grocery store in Lebanon, Indiana, for a year, then became an apprentice in a carpenter shop. In his eighteenth year he formed a. partnership with a co-worker and they became contractors and builders; and in October, 1882, he disposed of his interests in the business to his partner and came west, locating in the city of Madison, Madison county, Nebraska, accepting work on what was then the new school building doing the inside finishing work. He continued to work on various buildings in Madison until he, in 1884, opened his own carpenter shop and became a contractor and builder. In August, 1885, Mr. Wycoff accepted a position in the Ramey & Wyatt general hardware store, and was with this firm four years; Mr. Wyatt selling out his interest to Mr. Ramey in 1889, and Mr. Ramey one year later, in 1890, selling out to William Parkinson. Mr. Wycoff remained with the store during these changes, and was with Mr. Parkinson until April, 1902, when the firm of the Hume-Robertson-Wycoff Company was formed to take over the Parkinson store, Mr. Wycoff becoming the active manager of the business. The company has large and extensive business interests in Madison, having large lumber and coal yards, and grain elevator, etc., being one of the largest firms of its character in this portion of Nebraska. Mr. Wycoff was married to Miss Jessie A. Crue at the home of her parents in Madison, Nebraska, October 7, 1886, the Crue family being one of the older Madison county families. Mr. and Mrs. Wycoff reside in the same house where they were married, it now being one of the pleasant modern homes of Madison. They have had five children born to them, four of whom are living: Neal A., who attended college at Des Moines; Ruth, deceased; George R., junior, Elanore Irene, and Charles T., who resides under the parental roof, and are a pleasant family.